I’d always been a vodka-tonic kind of person. Clear has been where it’s at. 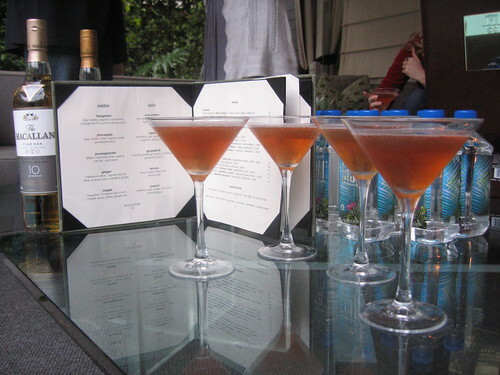 Like so many others, I started with the sweet, girly drinks (Amaretto Sours in college, anyone?) and when I finally realized there’s a better part of me that experiences narcoleptic tendencies I naturally stuck to the clear drinks unless absolutely special. No juice and therefore sugar. It was the safe bet with nil “crash agents” in the ingredients. Having only one drink regardless of where you go is like having a one-track mind. You could be missing out on really good stuff by people who knew what they were doing. It was my turn to learn the goods. Time to grow up. Not that much. Maybe I’ll just say it was time to open my mind. And it started with the first time I’ve ever had The Macallan. 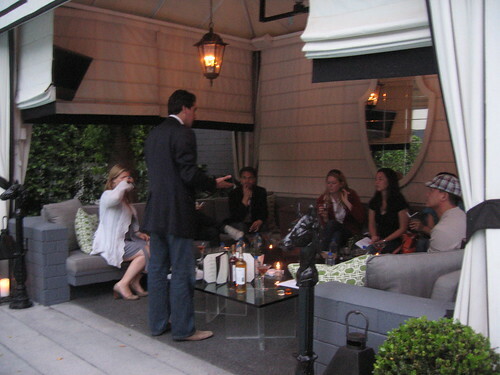 And then came the opportunity to host a tasting of The Macallan in Whist at The Viceroy in Santa Monica. Brand Ambassador Eden Algie graciously gave us a lesson in appreciating single-malt Scotch. Bloggers CarolineOnCrack, H.C. of L.A. and O.C. Foodventures, Maya of ShopEatSleep and Julie Wolfson of LAist were on hand to learn and enjoy as were a handful of my friends. It’s a delicious cocktail suited to ease one into the taste of Scotch. It may be a tad sweet for those who regularly enjoy, though. The Macallan is such a smooth spirit that I’d prefer drinking it straight up or with a little bit of water over mixing it in such a manner that it tastes less like Scotch. Maple was definitely tasty, though. We added a bit of water to our neat glass of Macallan 10 Fine Oak in an exercise in seeing how it breaks up the viscosity of the Scotch a bit so that flavors are brought to the surface. I could see myself enjoying Scotch in this manner with no guilt and all the pleasure. I liked that this particular Scotch seemed light enough to drink any time during the day. As with many things, I could see how the aged-10 Fine Oak was a way for The Macallan to be more approachable to regular whiskey drinkers. 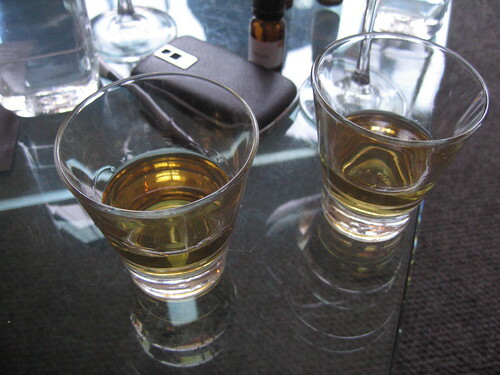 The Macallan 18 Sherry Oak, which is darker in color, was also delicious in a more robust and full-flavored way. It was smooth, aged and rich. What makes The Macallan single-malt is the fact that it is made from one distillery, which began in 1824, whereas the absolute majority of Whiskeys are blended from several. The Macallan malt whiskey in fact is added to blendeds as its “top dressing” so a glass of single-malt is special, indeed. No peet is used in the process and only 16% of the original stills are re-distilled (blendeds use 60-70%) and aged in ex-Sherry casks made of European oak (Sherry Oak line) shipped unbroken from Spain. In the Fine Oak line, the stills are also partly aged in American oak ex-Bourbon casks. All color The Macallan Scotch retains is 100% natural. And no tasting would be complete without a centerpiece at which to gawk. 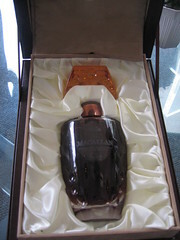 That was the bottle of The Macallan 55 Sherry Oak – which would set you back $16,000. Want to just settle for a taste? A shot of the 55 will run you an easier $2000. As for me, I was happy to enjoy the view. 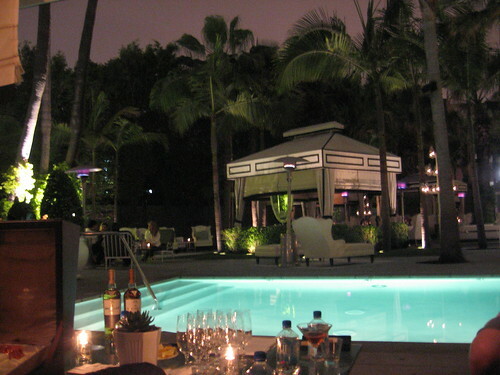 This entry was posted in Events, Santa Monica and tagged eden algie, fine oak, scotch, scotch tasting, sherry oak, single-malt, the macallan, whiskey. Bookmark the permalink.